Noah Blue Elk Hotchkiss was born August 18th 1998. He is Southern Ute on his maternal side and Southern Cheyenne and Caddo on his Maternal Grandfather’s side. Noah was active in soccer, football, snowboarding and kayaking as a youth. On Nov. 16th 2009, a young man that had fallen asleep at the wheel struck Noah and his family head-on. His Stepmother and primary caregiver, Cassandra Yazzie was killed instantly, and Noah was no longer able to walk. After months of Rehab, Noah began to learn a new way to recreate and compete in earnest. He quickly became a proficient Mono-skier. In 2015 Noah became the first Native American national champion in downhill ski racing. Noah also became the first paraplegic to complete the grueling seven-day mountain bike ride from Telluride, CO to Moab UT with the famous blind climber Eric Weihenmayer. 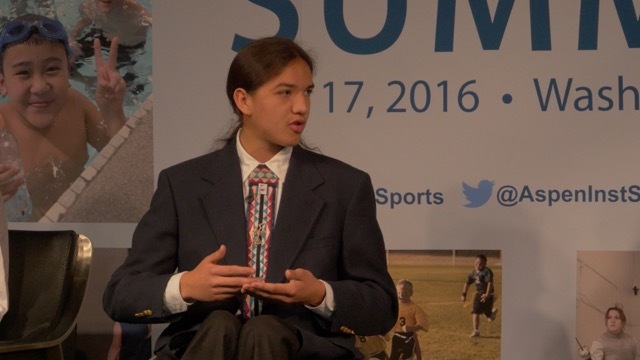 In 2015 Noah was also selected by Billy Mills’ program Running Strong for Native American Youth to be a part of the Inaugural class of DreamStarters. Noah continues to break barriers by participating in other adaptive sports as well including river rafting, tennis and most recently surfing. As the Native American Ambassador for Disabled Sports USA Noah is looking forward to developing the Tribal Adaptive Organization and being a part of a larger movement of inclusivity in Native America. His next goals are to pursue a Law Degree and represent both his tribes and the USA in Para-Olympic competition. In July 2015 Sports and Spokes Magazine, the nations premier magazine for adapted athletics, named Noah the 2015 Jr. Athlete of the year. He is the first Native American to be named in the 29-year history of the award. Administrative post to President Obama’s National Advisory Council on Indian Education. Most recently Noah was named a 2016 “Champion for Change” through a White House Initiative and Senator Byron Dorgen’s Center for Native American Youth. Visit noahhotchkiss.com for more information.